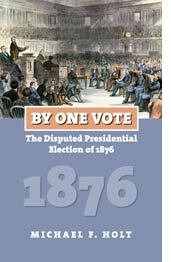 Most of the previous books about the hotly disputed 1876 election focus on partisan matters. Both Democrats and Republicans think that their side back in 1876 was either robbed of the election by nefarious means or ended up winning in spite of the other side using nefarious means. The nuts and bolts of the election are laid out in Michael Holt’s book, who looks at the election in terms of the actual important political issues of the day, the most important one being one that would make little sense to us today. Today, we think of the Reconstruction Era as one marked by: 1) Southern Republican governments propped up by Federal military force, 2) widespread corruption in government, and 3) the uneasy return of Southern Democrats into Congress. But, there was even more going on, especially with the economy, which was trying to regain its footing after the trauma of the Civil War. The national debt had soared and the method for the repayment of the debt to those holding securities was the hot button issue of the day. During the Civil War, currency was issued without any gold to back it up, but after a massive recession in 1873, Congress passed the Specie Resumption Act, which would require the Treasury to accumulate gold reserves and pay back bonds with gold instead of more paper money. This issue turned out to be divisive. A gold-backed currency would greatly reduce the money supply, making it harder to lower class and middle class people to get access to capital. The issue of specie resumption turned out to be even more divisive than civil rights. Although it is far harder to explain. (See the paragraph above for proof!) The Republicans had won the last four Presidential elections starting with Lincoln’s election in 1860. In 1868, Ulysses Grant easily defeated the Democratic Governor of New York, Horatio Seymour. In 1872, the Democrats didn’t even field a candidate. Grant was opposed by newspaper publisher Horace Greeley, running under the banner of the “Liberal Republican Party”, which ran on a good government platform. Grant won that election easily too. But, there was a financial panic in 1873. The Republicans lost heavily in the midterm elections in 1874, losing 93 seats in the House and the Speakership, although holding on to sizeable majority in the Senate. There seemed to be a way back to the White House for the Democrats in 1876. They had a well-financed candidate in another governor of New York, Samuel Tilden. Tilden’s finances came mainly from himself as he was one of America’s wealthiest men, making a fortune on Wall Street, before moving into government. And in an era before electronic media, Tilden’s cold personality, unimpressive looks, and lack of a family. The Republican frontrunner was former Speaker James Blaine of Maine. (He switched to the Senate after the Democrats took control of the House). However, Blaine had a lot of baggage and was not considered to be a good government candidate. Blaine’s principal opponent was Ohio governor Rutherford Hayes, who had an impressive Civil War background and had recently won the Ohio state house. Hayes needed seven ballots to win the nomination. William Wheeler of New York was nominated as Vice President. Hayes promised to return the country to a hard currency. Tilden needed just two ballots to win the Democratic nomination against some unimpressive competition. Thomas Hendricks of Indiana was nominated for the second slot. Besides the greenback/hard currency debate, Catholicism turned out to be an important topic. New York had passed a law that gave state money to Catholic churches to set up elementary schools, also Catholic nuns were allowed to teach in public schools. (Several other states in the Northeast had passed similar laws.) While this may seem to be a violation of the separation of church and state, it passed legal scrutiny at the time. Tilden did very little campaigning, and, much to the dismay of national Democratic officials, didn’t lend his own campaign much of his vast fortune to run the campaign. Tilden campaigned on a retrenchment of Federal government spending and hoped that most of the money not spent by the Federal government would be spent in the states or by private industry. As a Wall Street magnate, he didn’t have any strong support for soft money. The Democrats were fairly certain that they were going to win on Election Day. This was probably helped out by the fact that Tilden won a majority of the popular vote. However, three states were still in doubt: South Carolina, Louisiana, and Florida. If Hayes were to win all three of those states, he would win the electoral vote by a margin of 185-184. But if Tilden won just one state (or even just one elector), it was game, set, and match Tilden. And so the mess began. When it came time for the electoral votes to be counted, Congress realized that it had a problem. Nobody really knew who would adjudicated disputed electoral votes. The Vice President was in charge of counting the votes, but that office was vacant after Henry Wilson passed away in 1875. The Senate President Pro Tem, Thomas Ferry of Michigan, was now in charge of counting votes, although that job was mostly ceremonial. The Democrats, who controlled the House, insisted that BOTH houses of Congress, had to vote decide any disputes. They wanted all members to vote jointly, which would favor the Democrats. The Republicans pointed out that sort of defeated the purpose of having a Senate with equal representation for all the states. And Congress didn’t decide ANYTHING ELSE in that way. A constitutional crisis beckoned. The two sides negotiated back and forth. Some suggested that the Supreme Court decide the issue, but the Court was heavily Republican. The Democrats didn’t like that. The compromise was the formation of something called the Electoral Commission. It would have 15 members, five from the House (controlled by the Democrats), five from the Senate (controlled by the Republicans), and five members of the Supreme Court (who would be chosen by both parties.) It was believed that one member of the Supreme Court, David Davis, would act as an independent. Davis, who was Lincoln’s first major national political supporter, was considered open-minded. Then, the Democrats outsmarted themselves. Illinois Democrats had the state legislature elect Davis to a U.S. Senate seat. The thinking was that Davis would take his Senate seat after his Electoral Commission duties and be indebted to the Democrats for the Senate job. Instead, Davis decided to resign his seat on the Court and his position on the Electoral Commission to avoid any conflict of interest. Joseph Bradley, a Republican appointee, was chosen to replace Davis. When the Commission met to consider the disputed results, it turned aside any Democratic requests to “go behind the returns.” That is, the Commission just looked at the vote totals that were certified by the state government and would not entertain any evidence about any other events affecting the results. With those rulings, the Democrats were doomed in the three Southern states. The last hope for the Democrats was that they could peel away one electoral vote in Oregon. One of the electors there was a Postmaster when the election was held. According to the Constitution, electors cannot hold Federal office. The man in question had subsequently resigned his job, but the Democrats argued that since he was ineligible on Election Day, all of the votes for him had to be tossed out and the second place elector, a Democrat, would be chosen. Does this argument seem to be plausible? It wasn’t. The Commission voted against it. However, it was the only one that Tilden thought would work. Some historians believe that the Democrats knew that they couldn’t prevail in this dispute and were prepared to negotiate a compromise that would remove Federal troops from the South along with giving them some patronage concessions. Holt contends that the Democrats did not fully embrace any compromise talks until the Electoral Commission ruled against them in Florida. Another interesting point Holt brings up is that the Democrats could have avoided all of these problems if they had blocked the admission of Colorado to the Union on August 1, 1876. The Republicans had structured the law authorizing Colorado’s admission with a sort of pre-approval, almost like a modern day credit card. Once Colorado was able to set up a state legislature and constitution, it was in the club. This didn’t happen until so close to Election Day that Colorado didn’t even hold a presidential election. The state legislature appointed three electors. All of them were Republicans. If Colorado hadn’t been admitted to the Union, Tilden would have needed just 184 votes to win. Samuel Tilden retired from politics after the election. He died an extremely wealthy man, giving $4 million of his fortune, to endow the New York Public Library. Hayes, who promised to serve just one term, was plagued by accusations that he stole the election, even though by most accounts, Hayes was one of the few people in this drama with any sense of honor. The saddest part of the election was that a third party candidate, Peter Cooper of New York, running on the Greenback Party ticket did not win. Why? Just click on the link and you’ll see what America missed out on.